Thankfully, my start to 2009 has been far more positive than my work on this poor, neglected blog here. There’s actually a bunch of things to talk about, just finding the time to type it all up is proving difficult. But I’ll get there, bit by bit. There’s still a look into L33tspeak to come, as well as previews for more stuff down the line. Exciting stuff. Shiny. Like a silver piece sitting at the bottom of a clear lake. Or something. 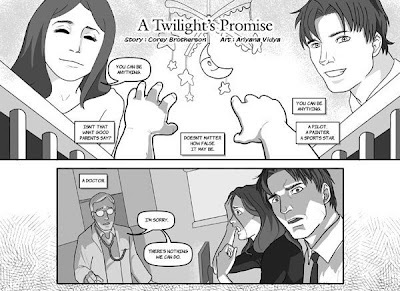 But as I quickly run off to work on one of these said shiny exciting, lake-bound things, I’ll leave you with an updated preview of A Twilight’s Promise, the one page story which is due to be published later this year, drawn by the increasingly brilliant Ariyana Vidya. Enjoy and I’ll see you soon. Really. Ariyana's drawings are very good.Hope she stays with you. This is a really good teaser, I want to read it all!!! Really nice team, you two ;) Can't wait to see more!